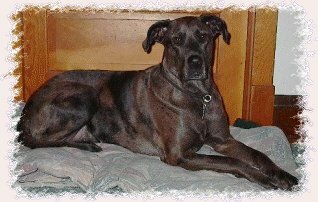 Molly is a chocolate merle, and our first Great Dane. She is unfortunately the result of poor breeding by someone just looking to make a buck. We should have known….. a “high quality” pup, and the breeder met us at the local gas station (her house is “too hard to find”). Not to mention Molly’s coloring. Whoever heard of a brown merle?! But we were young and dumb (and have learned better since). To learn more about off colorings and other genetically inherited traits visit the Chromadane Links & Info Page. 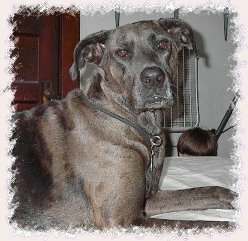 Molly is a wonderful dog and is so lucky not to have suffered more as a result of the poor breeding. Not that it didn’t cost us a pretty penny though. Molly developed mange shortly after coming to live with us. (The breeder could not be reached, of course.) She needed special shampoos and lots of vet visits until she was old enough (4 months old) to be treated with Ivermectin. Then she needed to see a veterinarian allergy specialist for severe allergies all summer. Thankfully we got it all under control, although with the amount of money spent on her we could have bought a very HIGH quality show dog. But we love her and wouldn’t trade her for the world!